An explorer’s mind is such that he does not examine, scrutinize everything lest some terrible falsehood might seduce him, because that would come from an attitude of an ultimate judge and a very superior attitude. An explorer does not imagine himself sitting on a mountain of gold while everyone else is sitting on a pile of something of his or her own making. An explorer pries open every closed can; he digs, travels, seeks and then he finds. If an explorer had settled on having it all, thus being satisfied with his arrogance, being so important and better than everyone else, then he would never venture out to find the truth. Columbus was an explorer and he was not satisfied with what he heard from coreligionists who still believed that the earth was flat and that it sits on pillars, and that there is an edge to our planet. No. He sought the truth, although he was laughed at. His superiors believed that they were better because they literally believed the Bible; yet, in their own subjective way. God opposes the proud so He never gives any revelation of the greater and richer truth to the proud, but rather the opposite—blindness, but the important one denies of being blind and claims to see. Hence, his or her sin remains. Jesus said to them, “If you were blind, you would have no sin; but since you say, ‘We see,’ your sin remains” (John 9:41). Superiority leads to supremacy, which is blindness, which is sin. With their blindness they were harming themselves and those they were teaching. They were teaching people falsehood, sensational and frightful stuff and not about the love of God, and about peace with God and with men. They gave no room for more, or for any other interpretation and insight. That narrow indoctrination has survived to this day. Luther also sought the truth, but he was labeled heretic, there was even a price on his head that whoever would kill Luther would do great service to God. Those who broke away from the Lutheran church were the Anabaptists. They were the again-baptizers because they have practiced baptism of adults through immersion. A child sprinkling with water is a nice blessing, but it is not a baptism, for as the word itself suggests, baptism means a complete immersion. So in Lutheran eyes the Anabaptists were a sect of heretics, but it started with one man, just as the reformation started with Luther. From the Anabaptists came the Baptists and from them many other splinters, like the Pentecostals, who in the eyes of the Baptists are also off (also today, but it is not being voiced but left alone). The line of those ‘heretics’ is long. A camp against camp, where are true peacemakers? It seems that people, as if quite on purpose, narrow their views, stop their eyes and put blindfolds on their eyes. Do they hate the truth so much? Do they hate light so much? Or do they love their well-defined selves too much? Columbus ventured out and proved others wrong. But there is a credible suspicion that he was a hidden Jew, and that he feared for his life. Around that time the Spanish “unholy” Inquisition was in full swing. 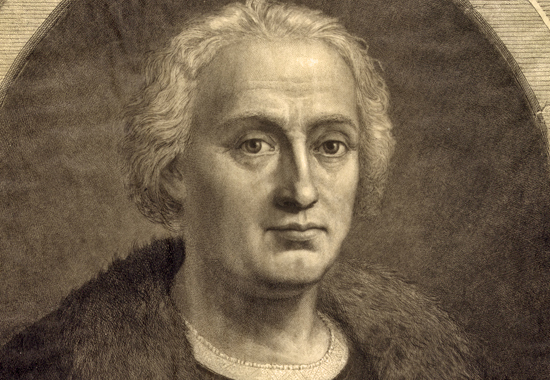 Columbus secured safe future for his children through legal means; obtaining assurances and obligations that no harm would come to his family. In fact Columbus was forced out of Spain in His quest for the truth, which proof the discovery of the American continent provided. Today, in Europe, the spirit of the truth-explorers seems to be gone. I was forced out of Jerusalem. Yes, God forced me to come to then the East Germany, where I was spit upon, ridiculed, laughed at, hated and even beaten. Yet, I returned and ministered repeatedly for many years, for God told me so. He asked me, “If you hate the German people then you create nothing new you do what others already do.” God wanted me to bring reconciliation and mercy. “You are a bridge builder.” The Lord had challenged me. I dared to be different and reach Germans and then also the German-speaking people. But to my utter shock I have discovered, from Hamburg, Hannover, Kassel, Nuremberg to Munich that I fell into a wasp nest. Yet I have continued. The Lord did not let me ‘off the hook’ yet. Pastors wanted me over and over again. They gleaned from my anointing. I gave them new vision and blessed their home groups, which blossomed and developed into churches. They have organized evangelistic campaigns only to fight over the newborn sheep, and divided themselves over who gets what and over money. I was shocked again. I spoke to almost a thousand people in Germany. Many were eating me like a dinner, over and over again, but when they finished they threw me out and closed the door. They still comb their teeth with that stubborn, judgmental and even crude toothpick lest anything of Joseph might still be stuck somewhere between their teeth. I redirected. I went to Holland, returned and started independent meetings, some attracted as many as 700 to 800 people in three days of meetings, which for Germany is quite unusual. In Altenburg a real revival broke out; drunkards were saved; people were healed; numbers grew. A cathedral-like church was getting filled to capacity with hungry-for-God people. Then some envious and jealous people (church authority) closed us down. It was too much for them; too much power; too much glory; too wonderful… I suppose. Fear. They prefer to get excited over their own greatness and go berserk in that direction rather than go for God and for His kingdom. Again, I only conjecture. I’ve been puzzled by this for over 25 years now, and I still don’t get it. To me it’s a strange phenomenon. I could have completed my work in less than five years, but it took five times longer; so you can imagine how I feel. Yes, I hold the Lord responsible for it, for He commanded me to go against my will (hardly anyone cares about that, does not want to understand, or does not believe that I speak the absolute truth). But who am I? – But a dung-pushing beetle. If I live I live; and if I die so I die. His will be done in everything. He is God. I am 57 years old and I am getting ready for yet another wave of God’s sweeping glory. The Berlin Declaration was against the move of the Holy Spirit, calling it “of the devil.” Americans did not make that mistake, nor did the Anglos, anywhere in the world. Why would Germans dare to do such a thing? Do they know everything? Are they the judges appointed to judge everything? They keep on trying, (überlegen), examining and reexamining… wasting time… as if the natural mind can grasp it all. Or, the natural man can grasp spiritual things. Where is the spiritual quickening? So often I say to the people, “Ask the Lord if I came from Him or I’ve sent myself?” But hardly anyone does it, because they do not know, hear or feel—evidence that they are spiritually lifeless; for all spiritual people, after they have asked, got a jolt of inspiration. That’s what happened in a church of 7500 people in Mexico City. My missionary brother, my translator into Spanish—James called and asked the pastor if I could speak on Sunday morning. The pastor replied that usually they do not have guest speakers on Sundays, but He said, “I will ask the Lord” and when he said it that the Spirit of God immediately fell on Him. James was already hanging up the phone, when the pastor cried, “Of course we want this brother!” Call it a hot Mexican temperament, call it anything; there is such a thing as spiritual quickening. “Were our hearts not burning when He spoke with us?” The completely unaware two disciples, on the way to Emmaus, reasoned betwixt themselves regarding the ‘stranger’ Jesus, (Luke 24). Those who examine everything and reexamine stuff are scientists studying physical things; and in that regard there’s no need for spiritual quickening. However, those who apply this kind of scrutiny to spiritual things remain in a limbo. They can make great machines, but in spiritual things they seem quite dumb. If they had any respect for God, any fear of God, regardless what people have been doing with this new awakening from Azusa Street in Los Angeles; they would not declare what they had declared. They had grieved the Holy Spirit. There is a deep grief over that land. Deep grief. I have always felt it and how many tears I have shed in that land. Even as I write this—which is only to let you know what I went through, what I think and what I feel—I still have tears in my eyes. I do not condemn one soul, nor do I blame anybody, I explore the German psyche and I still wonder. I remember in Hannover how a lady at whose house I stayed mourned over this sad fact. People were weeping over this (Berlin) declaration and repented, but they did not go up to the highest authorities those that did this despicable thing. No one arrived at that high seat of authority and church leadership and publically repented for it. None. To this day they still call it of the devil without knowing the history that led to this awakening. I gladly report that I have been labeled a Lucifer and that Luxum Light has something to do with this fallen angel and some already declared that I am a hidden Free Mason; and, as a foreigner, I sneaked into the Body of Christ to pollute it (perhaps also the pure Aryan race). I told Gerd that this will happen and it is beginning already. Hallelujah! The Berlin declaration of 1909(German: Berliner Erklärung) was a theological statement by 56 leading Evangelical theologians in Germany. The declaration condemns the German Pentecostal movement which had started two years earlier in Kassel. It stated that the Pentecostal movement was “not from above, but from below”. The declaration specifically mentions Jonathan Paul as the movement’s leader, but it is not clear that Jonathan Paul saw himself as such. The declaration was formally revoked by the Gnadauer Gemeinschaftsverbandes in a statement of January 2009. This move is seen a major step toward reconciliation between Pentecostals and non-Pentecostal churches in Germany. I personally believe that because of this declaration the German religious leadership exposed itself to something, which Jesus warned the Pharisees against. We do not know and that’s better than proudly declaring with certainty that we do know. In the 50’s America produced some of the greatest evangelists in the World and 100’s of thousand were coming to the saving knowledge of Christ, not to mention real miracles, signs and wonders. People like Aimee Semple McPherson, Maria Woodworth-Etter, Smith Wigglesworth, William Branham, Billy Sunday, AA Allen, Oral Roberts, Kathryn Kuhlmann, John G. Lake, Jack Coe, William J. Seymour, and Billy Graham and many more. All were mightily used of God. Today we are poised at another wave of God’s end-time move. Great or small, famous or unknown, we all must obey the Almighty and not just scratch our heads thinking over and over again struggling with our doubts regarding God’s existence. In Jewish Orthodoxy many do not believe in God the person, but only their religion. In Christianity many do not know God the person, but only their well-defined beliefs and their kind of theology. There is no time left for proving everything and proving again, there must come also the holding fast to that which one knows and is good. I have made myself available and I’m pressing on with God’s agenda. Have you? Rejoice always; pray without ceasing; in everything give thanks; for this is God’s will for you in Christ Jesus. Do not quench the Spirit; do not despise prophetic (gifts) utterances. But examine everything carefully; hold fast to that which is good; abstain from every form (appearance) of evil (Thessalonians 5:16-22). You must have something to do with the Holy Spirit before you can quench the tongue of fire ignited above you or other people. Only an unbeliever and an unreasonable person would dare to quench the Spirt alighted over those who hunger and thirst after God their Creator. Religion did not give them life; the Heavenly Father did. Religion in many ways restricts the way back to God and constantly tries to redirect the faithful to itself - religion. It is like escorting a group of people in a museum to a famous painter's picture, but the presenter points only to the the well ornamented thick frame that holds the painting. Those who are stuck only in the man-made frame (of religion) warn people against anything new and fresh. The Pharisees did that also; prejudicing people against Jesus, today many dare to condemn the move of the Holy Spirit, which Jesus promised, which came on the Day of Pentecost. In the post-Pentectost era the threat - against intelligence of an explorer - is very much alive. But, can you change it? - No, you can't. Then the disciples came and said to Him (Jesus), “Do You know that the Pharisees were offended when they heard this statement?” But He answered and said, “Every plant which My heavenly Father did not plant shall be uprooted. “Let them alone; they are blind guides of the blind. And if a blind man guides a blind man, both will fall into a pit” (Matthew 15:12-14). But as for you don't remain blind. Walk in the light for those groping in darkness lead their blind, but those who walk in light lead those who love the light.